FlipChamps Reloaded is fast. Too fast, at least, for my thumbs. This crazy, 16-bit mobile game locks you into furious combat that will have you tapping like you’ve never tapped before. The premise is simple: eliminate your opponent. To do so, you’ll need to collect some power orbs to charge up your attack. You can collect orbs by leaping — or flipping — between four different platforms in the top and bottom corners of the screen. When you’ve collected enough energy, you can unleash a devastating attack to kill your opponent and take the win. Various characters have different attacks. Pinky, for example, shoots a vertical laser beam that can hit opponents above and below you, while Melon launches a plasma ball that travels diagonally. There are plenty of other characters you can unlock as well, including a ninja, viking and more. Whatever character you choose, playing FlipChamps becomes an exercise in quick timing and on-the-fly strategy. You can flip from one platform to any of the other three, which you’ll need to master to collect orbs quickly. Your opponent can as well, making each battle a hectic game of cat and mouse. Both of you flip about collecting orbs until one of you has enough for an attack. Then you dodge about, trying not to get zapped, or trying to do the zapping. FlipChamps offers several different ways to play the game. If you’re flying solo, you can enjoy ‘Championship,’ ‘Arcade’ or ‘Challenge’ mode. Championship has you fight through a roster of 10 opponents to become the champion. Arcade challenges you to win as many times as you can. Every time you defeat an opponent, you get a new one. If you lose, you can ‘continue’ playing two times. Once you’re out of continues, that’s it. Finally, Challenge mode gives you a challenge to beat. For example, it’ll ask you to score so many points in Arcade mode with a specific character. Beating these can sometimes earn you a new character. 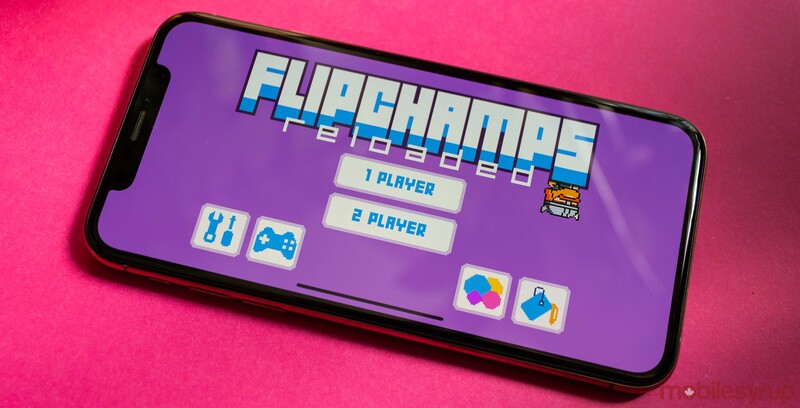 If flying solo isn’t really your thing, you can challenge a friend to play FlipChamps with you. While playing against a friend is an excellent addition, I found the playing surface a tad small for playing on my phone. Two player gives both participants a small virtual control pad to move around. The problem is, it’s tiny. I’d avoid this unless you have little hands or a bigger device to play on. All in all, FlipChamps Reloaded is a fun and challenging little battle game. There’s just something crazy fun about leaping around like a ninja, collecting orbs and finishing off your opponent. FlipChamps is available for free on the App Store. Ads support the game, but in my brief testing, I never saw one. You can purchase it for $2.79 to turn off ads.